Christmas is just around the corner and some of us still haven’t put up Christmas lights. 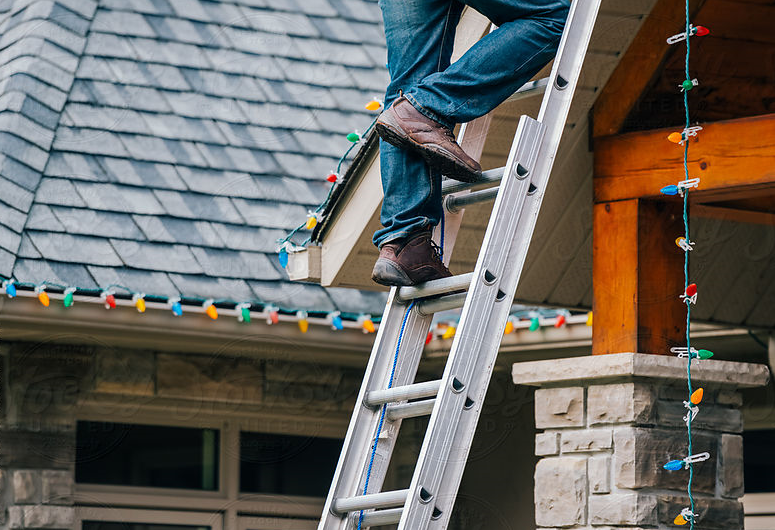 For some of the single-story houses, a step ladder can do the job, but for others, an extension ladder is needed. Ladders use can be an everyday occurrence on a job site and we wanted to take this time to go over some things to remember when using extension ladders, along with care and maintenance. When selecting an extension ladder, know that the top of it must extend at least 3 feet above the roof eave. Ensure that you are not setting up an extension ladder upside down with the fly section at the bottom and the base section at the top, rung locks engaged. 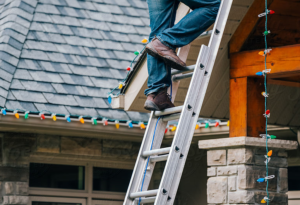 When the extension ladder has been used as a single ladder, ensure that all guides or brackets are properly assembled and engaged before you use it. Never make an extension adjustment when someone is standing on the ladder. Be sure the extension rope is tracking correctly on the pulley before making an extension adjustment. Never step or stand higher than the step indicated on the label marking the highest standing level. Never attempt to mount the ladder from the side or step from one ladder to another unless the ladder is secured against sideways motion. Inspect the ladder thoroughly before you use it each time. Clean climbing and gripping surfaces if they have been in contact with oil, grease or other slippery materials. Check bolts, rivets, rail connections and anti-slip feet for wear and tear. Inspect ropes, cables and pulleys for wear. When transporting ladders on vehicle ladder racks, support them properly with wood- or rubber-covered pipe with as little overhang as possible and secure the ladder to each support point. If a ladder has been exposed to heat, corrosive substances such as acids or if it has bent or broken side rails, the ladder must be destroyed so that no one is able to use it.